Author, 'Imaginary Animals,' The Mythical Zoo,' 'Stealing Fire,' Animals in the Third Reich'. History contains no simple lessons, but it is filled with suggestive comparisons and analogies. It does not enable anybody to predict the future, but it does help us develop a sort of intuition, a form of worldly wisdom. Through the study of history, one learns, for example, to recognize hubris in a ruler, at times when almost everyone else is carried away by his glamour. When Talleyrand learned of Napoleon's plan to invade Russia, he knew that the Emperor was doomed. More complex patterns occasionally emerge in widely separated eras, and I think there are some very strong analogies between the Islamic State today and the German city of Münster, when it was seized by Anabaptists in the year 1534. Forces allied with the mighty Holy Roman Empire assembled a large army and laid siege to Münster. As the plight of its citizens became ever more desperate, a young man who called himself "Jan van Leyden" took control, and his rule grew increasingly capricious and violent. Previously, Jan had been an apprentice tailor, an aspiring actor, and an unsuccessful innkeeper, but, claiming the will of God had been revealed to him in visions, he had himself declared king. While others in his city starved, and were even reduced to cannibalism, Jan and his close associates lived in royal splendor, all, he claimed, for the glory of God. Jan told his followers that Münster was the New Jerusalem, and that he, Jan, was the new David. In imitation of the Biblical patriarchs, he instituted polygamy, igniting a rebellion that almost toppled him, before it was bloodily put down. He took sixteen women for himself, and when one of them, Elizabeth Wandsherer, rebelled against him, he personally beheaded her in the marketplace, and then danced gaily around her body with his other wives. The Anabaptists were radical Protestants, who went beyond Martin Luther by questioning not only ecclesiastical but also worldly power. They rejected infant baptism, formal clergy, secular hierarchies, and private property. The only authority they accepted was that of either the Bible or of direct revelations from God. How could Jan establish absolute power in the name of an ideology that was, in so many ways, anti-authoritarian? In the sixteenth century, many people of all persuasions believed that the political, intellectual, and religious turbulence of their time presaged the imminent end of the world. 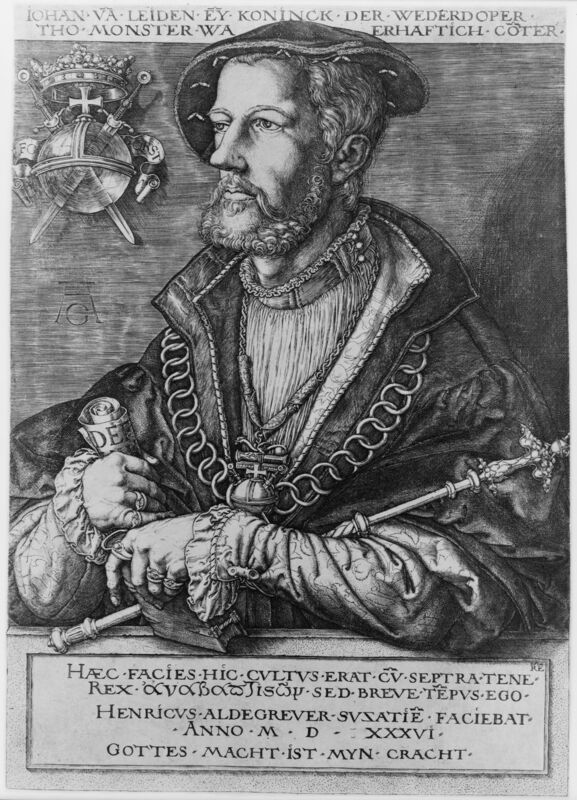 Prophetic visions were common, and King Jan was only one of several Anabaptists who laid claim to them. So did many Catholics including Ignatius Loyola, founder of the Jesuits, while Martin Luther once threw an inkwell at the Devil. It was a time in which extremes of skepticism and religious fervor thrived, often alongside one another. King Jan was a flamboyant showman who ruled not only by terror, but also by involving his subjects in the ongoing drama of his guilt, repentance, melancholy, and divine election. He, at times, went into moody seclusion, to emerge with a rejuvenated sense of mission, and danced naked in the marketplace to show his innocence before God. Just as the Anabaptists tried to recreate the kingdom of ancient Israel, the Islamic State now endeavors to reestablish the caliphate of the seventh century. The followers of King Jan believed they were living in the last days of the world, as do those of the Islamic State today. Both practice extreme violence, absolute subjugation of women, desecrating the sacred symbols of other faiths, and flaunting of their transgressions. Finally, both the Münster Anabaptists and advocates of the Islamic State have often startled observers with their theological sophistication. They have been difficult for more conventional religious leaders to deal with, because they simply take commonly held ideas to extremes. More generally, the crisis of Islam today, as it fragments into antagonistic factions, bears some resemblance to that of Christianity in the sixteenth century. Yet even detailed historical patterns can be like faces that we see in clouds, landscapes that we see in agate, or prophesies of the Delphic oracle. It is not easy to be sure whether they should be attributed to similar dynamics, providence, or our active imaginations. Caution is in order, but the history of the Anabaptist kingdom may provide some hints about both the possible nature and the eventual fate of the Islamic State. After holding out for 18 months, the Anabaptists in Münster were finally forced to surrender. King Jan was initially defiant, but he eventually repented his claim to royalty, and accepted the ministrations of a Catholic priest on the night before he was finally tortured to death. Perhaps he was basically a young man who, disoriented by the carnage he had already experienced, was overpowered by adolescent daydreams. Among those Anabaptists who survived, a few, known as the "Batenburgers," for a while continued their practices of extreme violence and polygamy. The larger number firmly renounced both, and their spiritual descendants today include the Mennonites and Amish, who are among the most pacifistic peoples in the world. Opposition to the Anabaptists in Münster brought together warring Catholics and Protestants, thus beginning a movement for religious tolerance. Like that of the rebels in Münster, the ultimate legacy of ISIS may be providing almost everyone with a model of something they do not wish to become.